Just wanting to remind you of this weekends classes. Please note - all our classes are now held at 6 Mingbool Ave St Marys. You can ring me on 0416053688 or 82771298 to book into any of the classes. Graphic 45 Layout - Double page. I have a double layout for this class using papers from "Once a upon a Springtime". You will need to bring your favourite fussy cutting scissors for this class. Cost of Class and Kit $38. Friday 14th 10am-1pm. Graphic 45 Project life Style - Double Pocket Page Layout. I have been sorting out my spare room and found a stack of "Couture" pads and papers. I have enough for 10 people to join me to make some beautiful couture cards for a project life style class. 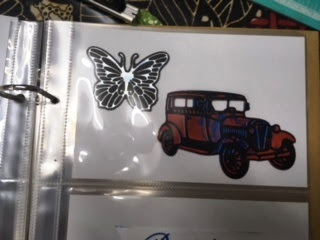 I will be using chipboard peacock feathers, charms, ribbons and more to create about 15 cards. Cost of Class and Kit $40. Friday 14th 1pm-5pm. Late Night Scrap 6pm-10pm $16 (soup and bread included). Please note there are no Classes Saturday. Hot Foil Demo and Sample Kit. Kathy has a fun class planned for Monday morning. If you are interested in the foil machine and what it can do then join us and have a play. Kathy will demo all the different things you can do with the machine then let you have a go to make your own samples. If you already have one then bring it along or we will have a couple here for you to use. We also have a special offer on a bundle deal - 2 hotfoil stamps and 2 rolls of foil + machine for $120. 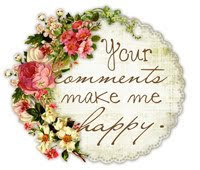 Last month Kathy introduced her ladies to Lindy's Stamp Gang magicals and everyone had so much fun. 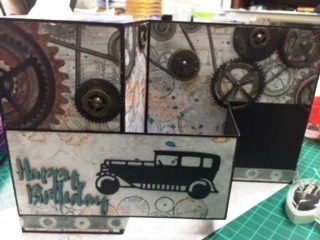 She decided to make some more male cards using them and adding some more techniques. Other than your basic kit you will need to bring a dark brown ink for edging and a paper distresser. All other supplied unless you want to bring your own magicals. Cost of Class and Kit $36. Friday 28th Workroom Available + Late Night Scrap. 10am-10pm. Friday 12th Graphic 45 Layout 10am-1pm. Friday 12th Graphic 45 Project life style Pages 1.30pm-5pm. Friday 12th Late Night Scrap 6pm-10pm. Saturday 13th Junk Journal Page. 10am-2pm. Monday 22nd Kathy's Christmas Cards Workshop 10am-3pm. Friday 26th Workroom Available + Late Night Scrap 10am-10pm. 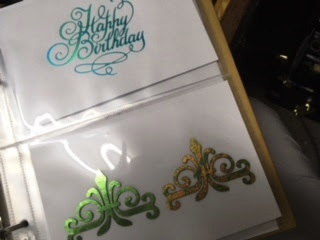 Saturday 27th Simple Watercolour/foil Cards 1.30pm-4pm. So hopefully my crazy life will be setting down soon and I can get back do making more kits for all my interstate friends. I have about 15 kitted up and just needing instructions.